I guess we were taking a little toooo long, the first time. When she was DONE, she was DONE. Uh, never mind that WE WERE NOT. She backed herself right out of the stall with the milking equipment still attached. Our poor intern was thunder struck. All I could do was laugh; it had happened to me in the past. Go with the flow. BUT; have to get the head stall bar put back in, so she could not back out of her own free will. 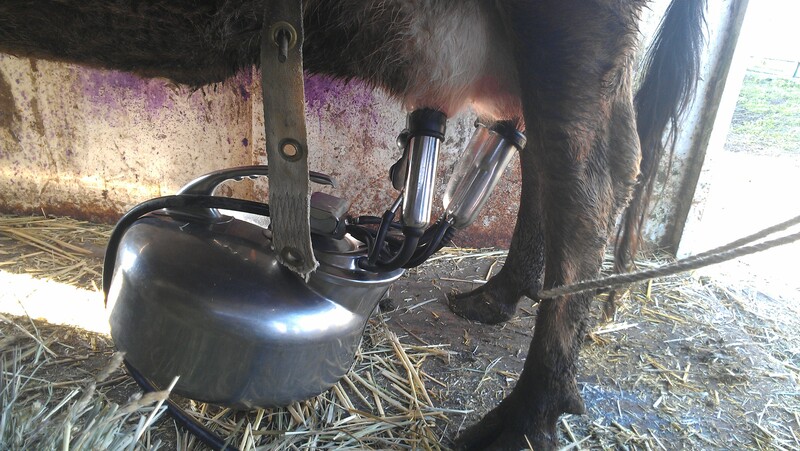 In the picture you can see the silver Inflaters, on the teats, which pulsate with a light rhythmic vacuum, and milks the cow out in about 10 minutes, into the large bucket. 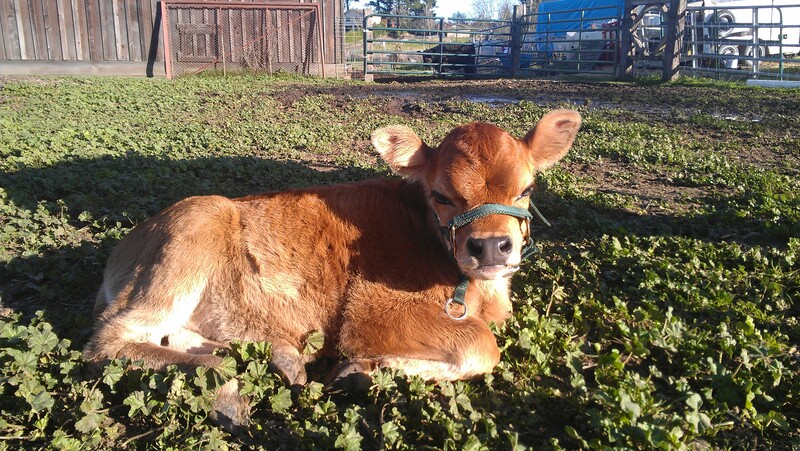 It is suspended from a back-strap… and goes with the cow when she moves around in the stall. The time-consuming part is the cleaning of the udder and the teats to insure they do not contaminate the milk. The bucket is taken directly back to the house, filtered, and refrigerated. We also pay extraordinary attention to the proper cleaning of the equipment, after use, to prevent any source of contamination building up. Understanding aseptic technique (clean) is critical. Why don’t I keep a pristine clean milking stall? Because 99.9% of microbes are either beneficial or benign (i.e. don’t cause a problem). If I kill them off all the time (with chemicals, etc.) I am providing a petri dish to grow bad bugs. In nature, there is NO such thing as an empty niche. Odds are, over time, it will be a bad bug we can’t kill. With good “aseptic technique” we prevent contamination in the first place. Any milk that is questionable goes immediately to the pigs… nothing is wasted and there is no urgency to keep every drop for our personal use. We err on the side of caution… something the industrial business model does not always follow, sad to say. We also add in some kelp meal & D.E. (diatomaceous earth) to her daily ration. They offer her micro nutrients that might be missing in the soil the hay was grown in. The D.E. also functions as a natural dewormer that we use with all our livestock.